Alrighty kids of the shuriken and high imagination, here's the official movie poster and full length trailer for Shuriken Sentai Ninninger VS Ressha Sentai ToQger: Ninjas in Wonderland! 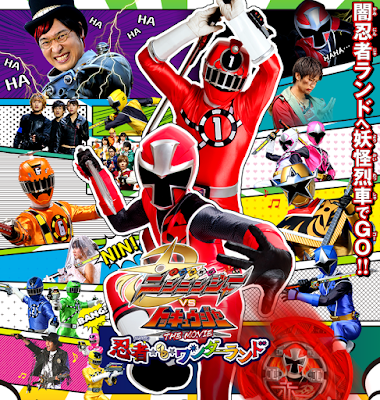 Shuriken Sentai Ninninger VS Ressha Sentai ToQger: Ninjas in Wonderland! is set to premiere in Japanese cinemas next year, January 23, 2016. Same here both of these series do not sit well with me but this trailer looks interesting. Considering the last team up was a disappointment as all hell I hope this one will be good. I hope!